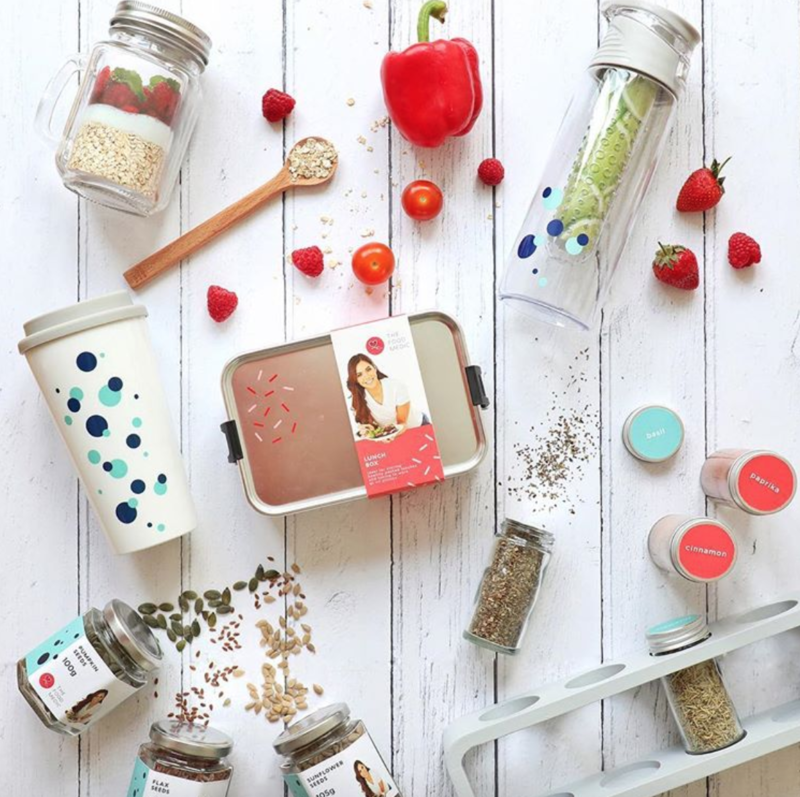 As the queen of lunchboxes and healthy meals in a hurry, I wanted to create a range that helped you to stay healthy even during the busiest of timesIn my new range you can find; a lunchbox, a reusable coffee cup, a water bottle with a built-in infuser, a spice and herb rack with all my essentials, a seed mix for a quick boost of healthy fats and protein to any meal, and a mason jar for your overnight oats and smoothies! the perfect gift for those always on the move. Complete with delicious peppermint tea bags, this double-walled tumbler will keep your tea nice and hot while out and about, whether you are commuting to work or on a leisurely Sunday morning stroll. Put one tea bag in to the cup, pour on boiling water and infuse for four to five minutes. Can be served with a little honey or sugar to taste. A great little aluminium lunch box with a clip top lid – ideal for storing your packed lunches to take to work, school, or on picnics. The perfect water bottle to keep hydrated on the go! This handy bottle comes with a built in infuser too – simply add any chopped fruit of your choice (try lemon, strawberries, or orange) for a delicious drink. A great gift for those who love to start their day with a delicious and nutritious breakfast – even on busy days. This set not only comes with it’s own little wooden spoon, it also includes chia seeds and oat flakes to get you started with creating the perfect overnight oats. The jar is also marked with handy measurements, enabling you to prep your breakfast quickly by just filling the jar up to the marked lines with your chosen ingredients. A trio of seed toppers. 3 generously sized glass jars filled with pumpkin seeds, sunflower seeds, and flaxseeds (also known as linseeds). These lovely little seeds make a great addition to granolas, and smoothies, or to top soups, stir fries and more! 4 little spice jars with a handy holder ready for any recipe – sweet or savoury. The set comes with earthy cinnamon, herbaceous basil, smoky paprika, and aromatic rosemary.